TV's favorite defective detective, Adrian Monk, returns to solve a new batch of baffling mysteries with his trademark wit, wisdom and hand wipes. 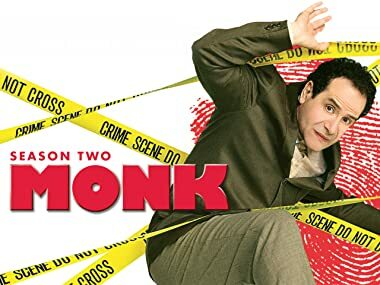 Join Emmy and Golden Globe-winner Tony Shalhoub as the quirky and obsessive-compulsive detective in all 16 brilliantly funny second season episodes of the widely acclaimed series, Monk. Monk takes a job as a substitute high school teacher to determine whether a teacher's fall from a clock tower was really a suicide, or a lesson in murder. When a ruthless CEO and his wife are lured to their deaths, Monk connects their murders to a baseball great and his quest for the homerun record. Monk travels to Mexico to investigate the mysterious demise of a skydiver who reportedly drowned to death... in mid-air. When a circus ringmaster is murdered by a high flying daredevil, all leads point to his vengeful ex-wife. But how could the acrobatic ex have committed the crime with a broken foot? Captain Stottlemeyer takes a page from the book of Monk in order to determine why anyone would want to murder the world's oldest man. Monk reluctantly takes the stage to investigate an actor's murder. Monk knows who is behind a string of mail bombs that have been exploding around San Francisco. The only problem is his primary suspect... is in a coma. When a high-powered magazine publisher chokes to death under mysterious circumstances, all clues lead to the infamous swinging party palace, The Sapphire Mansion. When a rash of murders sweeping the city goes unsolved, Monk is called upon to find a correlation with the victims and stop a killer before he strikes again. When his paperboy is murdered, Monk turns to the pages of the newspaper for clues to solve the baffling crime. What could possibly make a cherry pie worth killing for? Monk finds out, with a little help from his long-lost brother Ambrose. John Turturro guest stars. Monk suspects the star of a hit TV crime show of killing his ex-wife. His only problem: the actor's rock solid alibi. Sarah Silverman guest stars. A law student promises to get Monk reinstated to the police force in exchange for his help in finding the kidnappers of her beloved grandmother. When the Captain's wife falls victim to a union dispute gone awry, it's up to Monk to find out what really happened and bring Stottlemeyer back from the brink. It's unholy matrimony as Monk and Sharona pretend to be married to get the goods on a con man. When a death-row inmate is murdered 45 minutes before his execution, Monk is brought in to find out why.